Thank You very much for your fantastc altered food container entries, Sarah will be picking the winners soon and will be posted as soon as I can. We have a new challenge for you this fortnight and its an easy peesy one set by Donna who's like to see SPOTS & STRIPES somewhere on your design. Remember to read the house rules before entering as we have a cap on 10 challenges sorry! 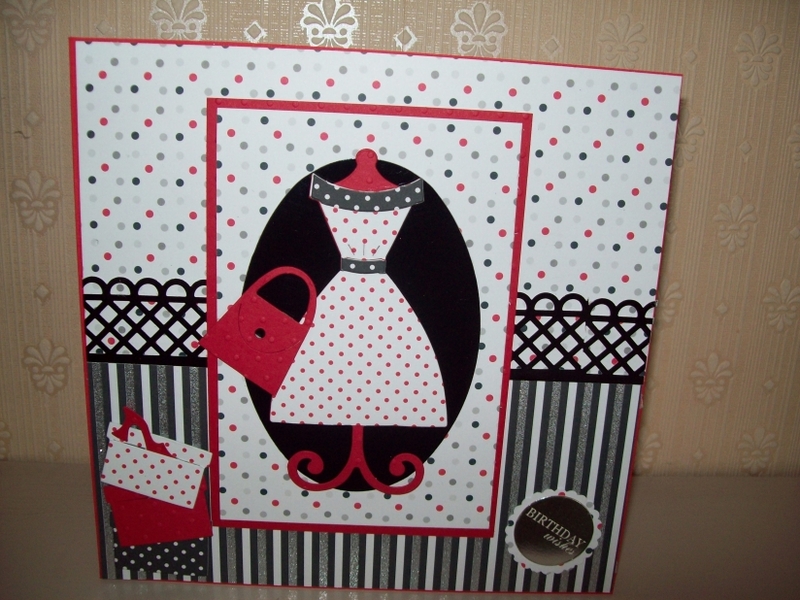 At One Stop Card Crafts we have a big range of ever changing discount making and card making craft supplies. We are always adding to our range of craft supplies which are ideal for making handmade greeting cards, do-it-yourself invitations scrapbook pages, altered items and much more. Over to our fabulous girls and their makes! As it was my turn this week to choose a theme I decided to go with something that I'm sure we all have in our stash. Something spotty and stripey. Be it papers, an image, embossing folders etc. 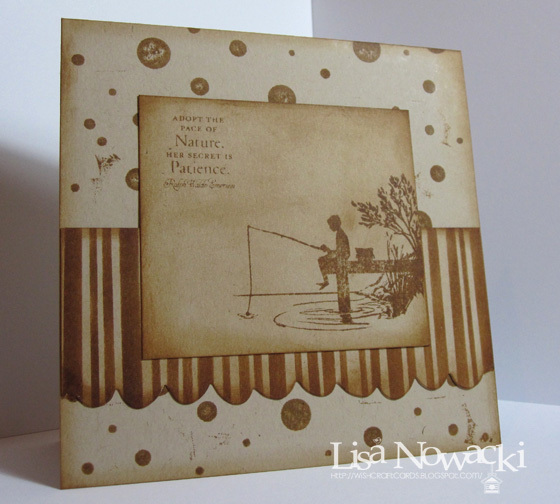 For my card I made a base using Martha Stewart Cherish PATP. I used a gorgeous Sassy image and coloured her in with Promarkers and Derwent pencils, blended with Sansador. The papers I used were a freebie from a mag. 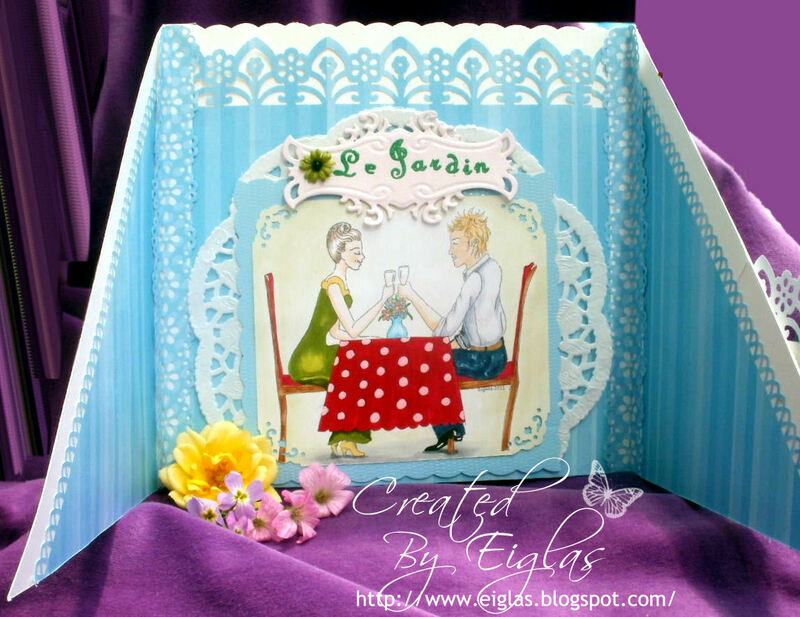 I cut out the image using Spellbinders Labels 20 & added some eyelets and ribbon. I added some flowers made from an x-cut puch and added some Craftwork Card Candy, a charm, some gems and Martha Stewart butterfly. For this challenge, I decided to try some digital paper-piecing. The image is from Lillyboo. I put together three patterned papers using 'sunflower' colours in Photoshop Elements, and then digitally cut pieces to fit the carpet, walls and bean bag. After printing, I coloured the rest of the image with Promarkers, The side panel and flowers use Coredinations card which I've embossed using a Cuttlebug folder and sanded. 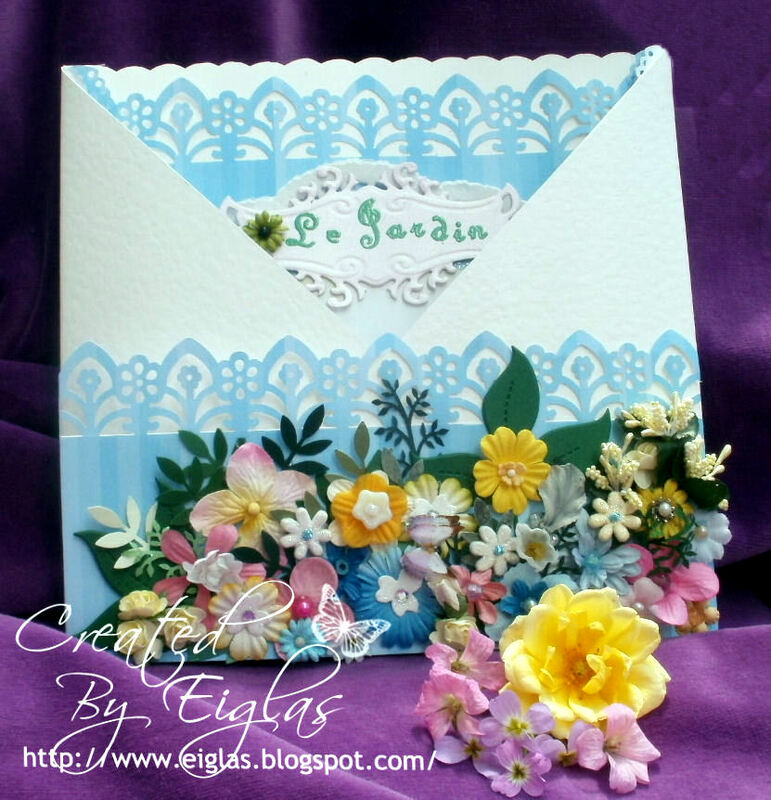 I cut the flowers using a Spellbinders die, and the leaves are punched. ﻿I recently bought a pad of colourful papers, which provided the spots and stripes on my card. I’ll be hiding this one away from my OH. I’ll keep it for his birthday. A die cut oval, with the dreaded peel off to give contrast. 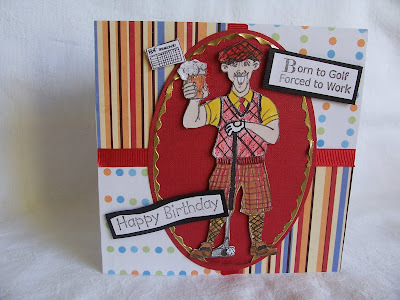 I stamped the golfer from the Flippen Men series. I coloured him in, using Promarkers and watercolour pencils. I hope the glisten, with glitter glue shows on his glass of beer. For my spotty/stripey card I have used my Tatty Teddy stamp coloured with PMs .The DP are also tatty teddy and the stripey bit is from a forever friends paper pack. 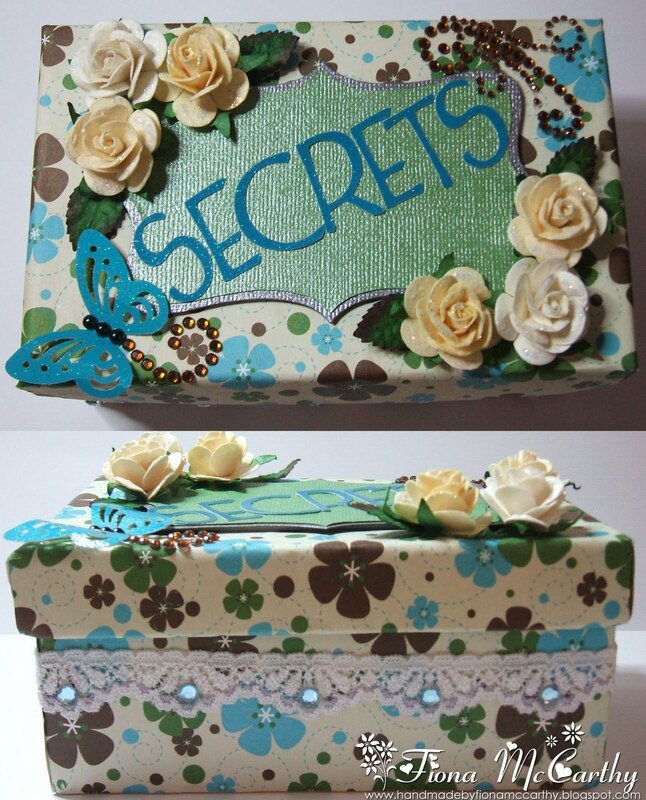 I have used my Martha Stewart deep edge punch and some spotty ribbon. The flowers are from Bo Bunny,sentiment from Craftwork Cards and little heart pearls are from my stash. I made a little card for a friend using some of my new papers! I stuck with a basic wee layout using my new echo park paper punched with my Martha Stewart Punch. I used a wee old image I've had for a while coloured with promarkers, added some ribbon, gems and used my new Rose dies for the wee flowers. 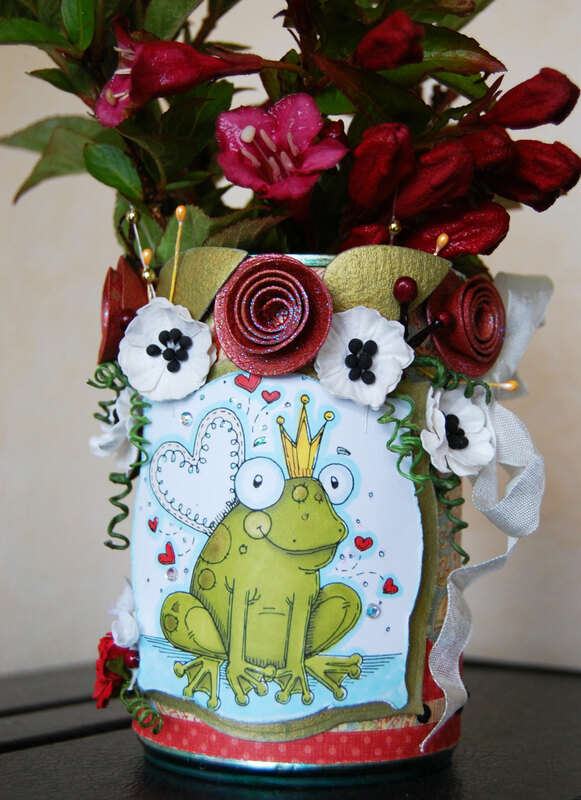 The sentiment is a C.C Designs stamp. Ive used Basic Grey papers, Art Journey stamp and a spotty ribbon! My card has been made using the Mr Gnome digi from Digital Delights by Louby and the sentiment is from Tiddly Inks. The spots are a red and white ribbon that had been laid in stripes on white card. I have also used a striped paper from DCWV to mat the main image onto. I often use spotty and stripy papers on my cards, so I thought I'd try something a bit different and create my spots and stripes using distress inks instead. The spotty background was made with a Penny Black stamp, and I made the stripes by masking sections off with post it notes and then inking. The main image and sentiment are Flourishes stamps, all cardstock is Stampin' Up Kraft card, all stamping/ inking using Brushed Corduroy distress ink. I would never normally combine spots & stripes per se as I usually have quite a fussy style to begin with but I may just try this again! I had a slight problem with my glue not setting - probably the heat - so I didn't quite do everything I wanted to do with this card. Papers are DCWV and a doily, flowers a mix of Prima, Wild orchid and poundshop. The image is my own Eiglas 'Un bon repas pour deux' coloured with my Copics. For this I used a lovely free image by Sureya who has an open colouring book over on Deviant Art coloured with promarkers. Papers are digital from bearly mine, flowers were from qvc, metal sentiment I've had forever! Good Evening! Apologies for my lateness! I usually prep the post the night before but my wifi went down so thought I'd do it this morning but have a very sick lil girl who's finally gone to sleep - what a day! Thank You for you Love the lasting kind entries, winners will be announced soon when Benita has chosen. Onto todays challenge which is sponsored by Joanna Sheen who is offering a £10 voucher to her online store which is crammed full of goodies and lots of sparkly things! 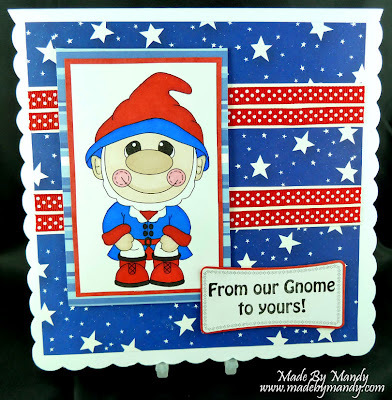 It's my turn here at Crafty Cardmakers to come up with a challenge, and they say to take inspiration from something you love, and I love food! I am surrounded by lots of inspiration in my evening job, and one night, whilst folding boxes I came up with an idea that one of the boxes we use to serve up combos with would be perfect for a makeover. I painted it with white acrylic paint, then waited for it to dry before overspraying with Adirondack color wash, then when that was dried, stamped over it with a variety of swooshy stamps using Stazon ink. It has two holes for dips which are perfect to put tealights in (the battery operated kind unless you want to set fire to your box lol) and lined with shredded tissue paper, it is perfect as a little gift box. I have placed a tealight garden hanger in it, but with a little modification and maybe the addition of a mirror to the lid, it could be used for keeping make-up or jewellery in. Or anything at all which you want to give as a gift! I really hope you have as much fun as I did on this challenge - I can't wait to see what you come up with! This was a box holding those little thin biscuit sticks covered in chocolate which my DD loves. She also loves painting and bought a set of the Paint Fusion Stamps, so we had a go together with no DVD to watch either. The daisy on the front of the box is my attempt so all you fab painters please don't laugh too much. I painted the box with a couple of coats of acrylic paint, painted the inside as well as I didn't like the grey cardboard showing. 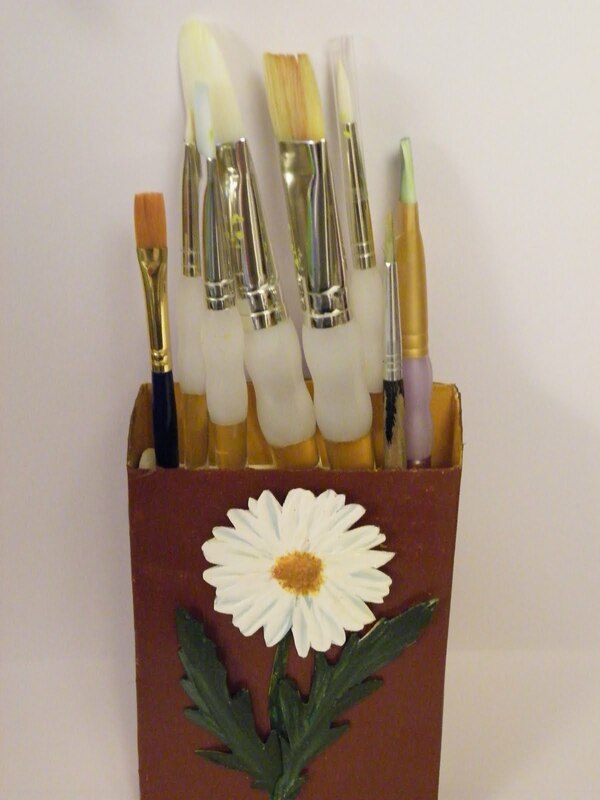 I took the lid and cut some holes for the new paint brushes to sit in. My DD loves it and I was really pleased with it when I was finished. For my altered food container I decided to make use of a cheese triangle box. I thought it would make lovely storage for my pins. After taking off all of the original design, I coloured around the the edge of the lid using a Promarker. I punched some copier paper using a Martha Stewart punch and pleated it around the side, then added a strip of contrasting paper over the top. I then layered up a couple of circle nesties using foam tape and stuck them onto the lid. Added an Humphrey's corner image, which I coloured with Promarkers. Then I added some letter tiles and Martha Stewart flowers and butterflies. Some card candy and gems to finish. 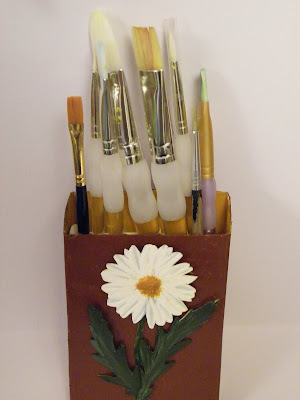 For my altered food container I started with an Asda Hero Puppy Pouch box. I first painted it with white paint, no idea why cos I ended up covering it in Bo Bunny paper. I wrapped a long length of white stretchy lace fabric around the middle and also a length of purple satin. I made a couple of bows from the satin and stuck them in the centre of the ribbon. Some Tim Holt diecuts and a few petaloo flowers finish it off. I am using it for storing my Bigz dies, as currently they are inside a zipped container and I can normally not be bothered to drag them out, perhaps I will be encouraged to use them more now. I wanted to do something totally different! So after sitting staring at the jam jar for hours I thought it was starting to look like a toadstool(too much staring and thinking)! So white paint, flowers, glitter and fimo at the ready I made this wee toadstool! It needed something else so the lil fimo princess was made from following a sugarcraft book! I used a soup can for my altered food container project, after having the soup for my lunch today :o) I washed and dried the can then painted the rims top & bottom with alcohol inks, I then cut a strip of DP to cover the can and stuck it on with double sided tape. I added a border at the bottom and then made 6 grunge paper roses with leaves using a Marianne Creatables die which I painted with Twinklin H2O's. After sticking the roses on I coloured the Meljens image and die cut the cardstock and a piece of grungepaper which I coloured the same as the leaves to mount the image on. A few random flowers, some ribbon and other odds and ends finished it all off.